Hole 1 First shot, I drive 280 yards and into the woods. The second shot, I try using my gap wedge to escape from the woods, but the ball hits tree and almost returns to the original position. At last, I use #7 iron to chip and escape from woods successfully. 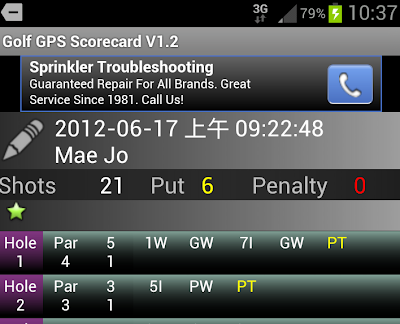 Download Golf GPS Scorecard V1.2 from Google Play. 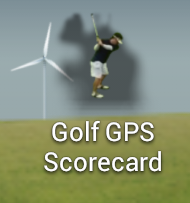 And use Golf GPS Scorecard to tell your own Golf STORY. Add Traditional Chinese Version. Improve user interface largely, particularly the camera view and the layout in "My-Shot-Screen". Add "Game Statistics" function. Improve user interface, add "sparkle text" on current GPS position to remind user.Improve user interface, change input method for "Hole" and "Par" settingClick "Hole" or "Par" button will increase by 1. Long click "Hole" or "Par" button will decrease by 1 .Improve performance and the bug fixed.